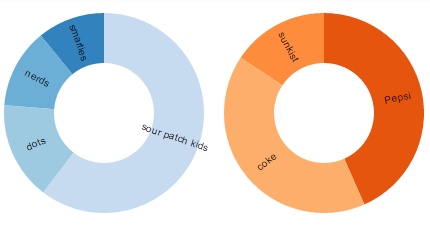 I'm currently stuck on how to traverse a JSON structure (I created) in order to create side-by-side donut charts. I think I've created a bad structure, but would appreciate any advice. I'm working from Mike Bostock's example here: http://bl.ocks.org/mbostock/1305337 which uses a .csv file for source data. In that example he uses d3.nest() to create a nested data structure with an array of flight origins. Which allows him to create a donut chart for each flight origin. I'm a CS student, with little experience of data structure best practices and d3.js. The structure I created doesn't look "flat" to me so I'm not sure if I need to use d3.nest(). However, I'm not clear how to traverse chartOne and chartTwo using the structure as is. But I would like to be able to have one object to access chart1 and chart2. I'm tempted to create another array block in my JSON, but not clear if there isn't a more simple approach. After that, it's as simple as cleaning up the accessor functions for your data and Bostock's example works well.